Export your new idea track (with sync tone) to a file on your PC. Upload the exported file(s) to the collaboration. All DAWs include a feature to export tracks to external audio files. Common file formats include WAV, AIF, FLAC, MP3, OGG, and WMA. Kompoz works with any of those file formats. You might need to check your DAWs document to learn how to export, but in most, it's a simple as selecting Export from the File menu. For best results, be sure that you are exporting individual tracks into separate files, and make sure that each track includes a sync tone. 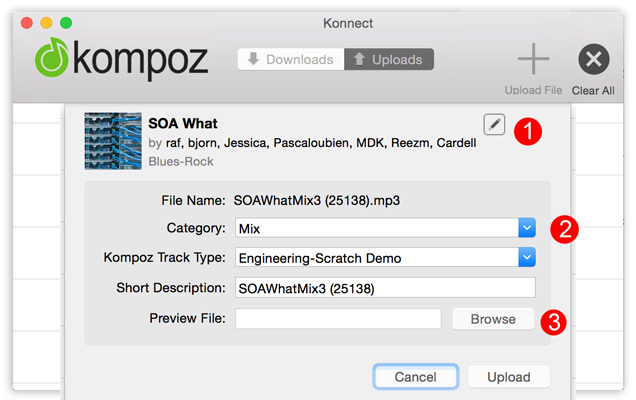 You can upload the exported files to Kompoz using either Kompoz Konnect, our desktop application for Windows and Mac, or by using the upload button on the Kompoz web page. Konnect is the best option when uploading a large batch of files. The web page is an easier option when uploading one or a few files. Both will work fine. Below is a quick how-to guide for using Konnect. Avoid errors by keeping the file name short (80 characters or less) and avoid using special characters or accented letters. If you have not already done so, download Kompoz Konnect from your settings page and setup your access key. There are instructions and links on this page. Next, run Konnect and click the Uploads tab, then the Upload Files icon, as shown below. As an alternative, you can also drag-and-drop the files you wish to upload directly onto the Kompoz Konnect application window. Kompoz Konnect will then display the file information dialog. Fill in the required fields. 1 Click the pencil icon to choose which collaboration the file will be uploaded to. 2 Select the file type, Sep or Mix. 3 Optional - attach a short preview mix. More on this below. Kompoz Konnect can figure out the category and track type based on the file name. 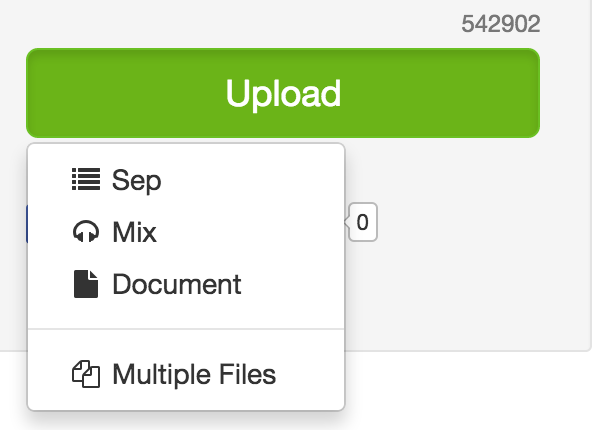 If you name your files by including the words mix or sep, and the instrument type, then Konnect will pre-populate the information, saving you typing and time. For example, you might want to name your files such as "mix-guitar-solo.mp3" before uploading. Press the Upload button to being the upload. Konnect will then present a progress bar, and prompt you for information on the next file (if you are using drag-and-drop to batch upload files). As an alternative to Kompoz Konnect, you can also upload tracks using your browser. Simply navigate to the collaboration to which you wish to upload, and select the Upload button on the top right of the screen.